About 3 years ago I decided to leave Corporate America after spending several months working with a life coach. It was the single best decision I’ve ever made and as a result, I thought I wanted to become a life coach so I could help others as I’d been helped. With each program I researched, though, there was something missing, until I stumbled upon the Institute for Eating Psychology. 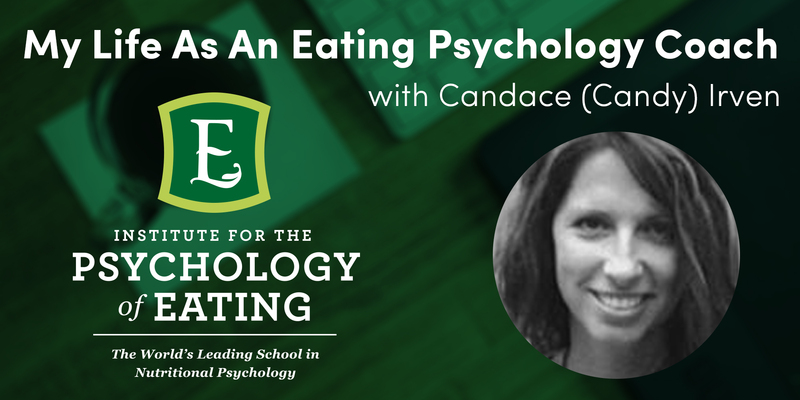 All of a sudden, I knew the type of coach I wanted to be: an Eating Psychology Coach. There are two things that I love most. First, I love the fact that our most intimate relationship is with food. How we treat food and how we let food treat us is an indicator of our deepest wounds and struggles that permeate almost every other relationship in life. The other thing I love is how it integrates lessons, best practices, strategies, and philosophies from such a variety of teachings. As a yoga teacher, studio owner, and Reiki Master, I like to integrate all my talents into my practice. While I do one-on-one work (both in-person and via the phone), my You + Food workshop, which integrates breath work, meditation and yoga with Marc David’s book The Slow Down Diet is by far my favorite way to dig into your relationship with food (and thereby everything else). The best part of the training — beyond ALL the information, wisdom and experience imparted by Marc — was hearing over and over and over that as a coach I don’t have to have all the answers and it’s not my job to fix a client. That was such a relief…and so empowering for both me and my clients. My favorite aspect was how it all comes together. Everyone learns differently, so the Institute’s integrative approach was wonderful. More than anything, though, I love that it all remains available to me whenever I want to revisit and refresh. A lot of women who find their way to yoga also have food struggles. This is not to say men don’t, but yoga is still predominantly practiced by women (for now anyway). My Training gives me new insight into their struggles and a vocabulary to begin exploring how healing can happen off the yoga mat, as well. I feel it’s made me a more well-rounded teacher and has given me another avenue to help my students and grow financially. They say we teach what we need to learn. I’ve found that it’s easier for me to learn relationship lessons by being more aware of my relationship to food. Where am I strong? Where do I need work? How do I self sabotage? It’s all right there in my relationship to a bag of potato chips…and so much more. I see my work evolving toward more workshops and one-on-one trainings. I see myself integrating the entire body (physical, mental, emotional, and energy bodies) into the healing process. If you are looking for a training that prepares you to truly help individuals to heal, check out the introduction videos. If you make it through the whole video and are energized at the end, that’s all the recommendation you need. That’s how I felt…and still feel. Whenever you finish any training, it’s always just the beginning of the learning process. The Institute does an amazing job of creating a support system for after you graduate. That’s when the real learning starts. BIO: Candy owns Tree House and Nesha, where she combines her yoga teaching certification, Reiki Master certification, and her certification as an Eating Psychology Coach to help heal the mind-body disconnect and societal obsession with body image by exploring our relationship with our bodies and our food.